UNITED NATIONS, April 15 -- With the UN's approach to climate change under fire, both politically and scientifically, the race is on to replaced Yvo de Boer as head of the UN Framework Convention on Climate Change. So far two candidates have come to UN headquarters and held press conferences: Costa Rica's Christiana Figueres and, on April 15, Barbados' Elizabeth Thompson. Inner City Press asked Ms. Thompson for her position on the widespread criticism of how the Copenhagen summit was run. She replied that there were both positives and negatives. She declined to comment on IPCC chairman Rajendra Pachauri's refusal to disclose how much is paid by Deutsche Bank and Credit Suisse, among others, for his climate advisory services. She said she would comply with UN rules. Video here. Inner City Press: how many candidates have been put forward? And can you say either by country or region? What can you say on that topic? And can you confirm that Mr. [Janos] Pasztor is actually one of the candidates, the current advisor to the Secretary-General on climate change? Spokesperson Nesirky: Well, two things. One is that, as we have mentioned before -- and it is standard practice, not just for this job but for any job -- we do not reveal the names of candidates. But I can tell you that there are 11 candidates from 11 different countries. And although we do not normally comment, as I said, on individuals, we obviously understand the interest in a candidate that works for the Secretariat and therefore we can confirm that Mr. Pasztor has been nominated by the President of Hungary. The appointment will be made following a normal competitive process run by a selection committee and in consultation with the bureau of the UNFCCC. All candidates will go through the same process. I should tell you -- and this is important -- upon the announcement of his candidacy, Mr. Pasztor was asked to dissociate himself from activities relating to the UNFCCC with immediate effect. Inner City Press: But how is that possible, to perform the job that he is conducting without in some way dealing with the UNFCCC? Can you explain that? Spokesperson: What I can tell you is that it will be dealt with in a transparent manner and Mr. Pasztor’s office is clearly not involved in the process of selecting a successor to Yvo de Boer. And, as I say, he has been asked to dissociate from activities that relate to the UNFCCC, and that is with immediate effect. And that is what is happening. This seems like a fake and flimsy safeguard. How can one function as the UN Secretariat's main climate advisor while "dissociat[ing one]self from activities relating to the UNFCCC"? For that, with all due respect for the affable Mr. Pasztor, one should quit or take a leave of absence. It's what Shashi Tharoor did, for example, while he ran unsuccessfully for Secretary General. 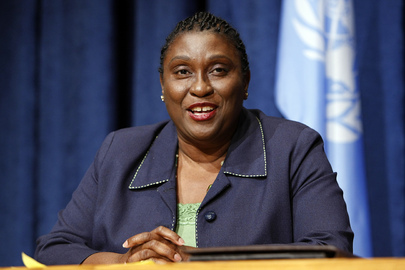 It is not enough to says like Ms. Thompson one would abide by UN rules -- because, in essence, there are no UN rules. Watch this space. UNITED NATIONS, March 22 -- The embattled chairman of the Inter-governmental Panel on Climate Change, Rajendra Pachauri, refuses to disclose how much money he makes from his simultaneousconsultancies with Deutsche Bank, Credit Suisse and other institutions. Now, a candidate to head the UN's Framework Convention on Climate Change, Christiana Figueres of Costa Rica, has announced she would cease all outside consulting if given the "full time and a half" post. Inner City Press asked Ms. Figueres on Monday for her view of Pachauri's side business and other IPCC matters. "That would not be my choice," Ms. Figueres said, of Pachauri's side work for business. She also said diplomatically that "Doctor Pachauri I believe is at freedom to allocate his time as he sees fit." Video here, from Minute 27:18. But shouldn't Pachauri at least be required to formally disclose who he works for on the side, and how much he gets paid? He has resisted even this. 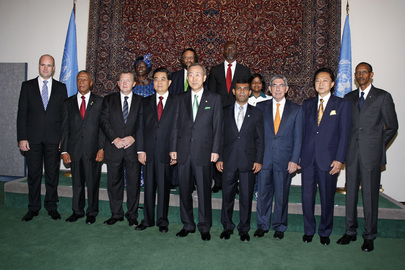 Inner City Press asked Ban Ki-moon and his spokesman for the UN view on this lack of transparency. The answer was that the IPCC is not a UN body, and that Pachauri would answer the questions himself. But when he came to the UN, seeking to use Ban Ki-moon as a prop and character witness, neither took any questions from the press. Ms. Figueres, the daughter of a former Costa Rican president, is viewed as a serious contender to replace Yvo de Boer, who is moving to KPMG (some are calling it cashing in). Inner City Press asked her if the recent appointment of another Costa Rican, Rebecca Grynspan, to the number two post at the UN Development Program might make it less likely she will get this job. "It may be a stretch," Ms. Figueres agreed, that a country of four million people could get two high posts. India's candidate is said to also have the support of China. UNITED NATIONS, March 10 -- Seeking to dampen controversies about the Inter governmental Panel on Climate Change's use of NGO press releases as science and about IPCC chairman Rajendra Pachauri's outside income from sources like Deutsche Bank, UN Secretary General Ban Ki-moon and Pachauri "encountered" the Press on Wednesday. It was a one way encounter. Each man made a statement, each praising the other and the IPCC -- and then they left the stakeout, taking not a single question. Deputy Spokesperson Marie Okabe was left telling reporters, no questions, no questions. Video here. The UN press corps was essentially used as a prop or as extras, to make it appear to viewers not paying attention that this was a legitimate press conference or Q&A. In fact, as put by one climate change activist, this was mere propaganda, like "something out of North Korea." Or perhaps Tiger Woods is the more apt analogy, given the "racy" novel recently published by Mr. Pachauri, another correspondent noted, in which an aging Indian scientist flies around the world bedding young followers. Back on December 21, Inner City Press asked Ban about Pachauri's presumptive financial conflicts of interest and failure to disclose, but Mr. Ban did not answer the question. Later, Ban's spokesman Martin Nesirky said that Ban did not have to respond to the controversies surrounding the IPCC, and that Pachauri would answer questions himself. 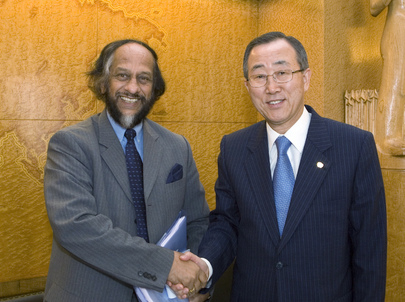 On Wednesday, Pachauri did not allow or answer any questions, and neither did Ban Ki-moon. What was first advertised as a sit down press conference at 12:30 was converted into a stand up stakeout from which the two men left immediately after speaking. So much for transparency. Watch this site. Footnote: while refusing to take or answer questions in supposed press encounters, the UN is holding two separate events for journalists in the next five days. Inner City Press will not be present at the first, but may report on the second, unless questions are taken and answered before then. Watch this site.